Chester Bruce Gowrie, always known as Bruce, was born on 14 April 1918 in the small Canadian village of Tramping Lake, which lies roughly halfway between Edmonton and Saskatoon, in the province of Saskatchewan. His parents were Malcolm and Phyllis Gowrie. He attended the local Tramping Lake School, which he left in 1936. He then worked as a post office clerk for four years, while also gaining experience of farming. He had thought about applying to join the RCAF before the war, so when the war came it was an obvious path to take. He was accepted as a recruit in February 1941, and was selected for wireless operator training. His pre-war hobby of building radio sets made him a natural choice to be selected for wireless work. After qualifying, he spent the Christmas of 1941 on leave and embarked for England in January 1942. More training followed, and at the end of June 1942 he was posted to 19 Operational Training Unit in Scotland. It would appear that he met up with navigator Richard Macfarlane and bomb aimer John Thrasher there, as the three were posted together to a conversion unit for final training on the same day in October 1942. There they were joined by flight engineer Edward Smith and mid-upper gunner William Maynard, and these five were posted to 57 Squadron at Scampton on 9 December 1942. Rear gunner Stephen Burns had joined the squadron a short while earlier, but the crew were without a pilot until Geoff Rice arrived in February. The crew then flew on nine operations before being posted together from 57 Squadron over to the new squadron being formed at the same base to undertake training for a special mission. 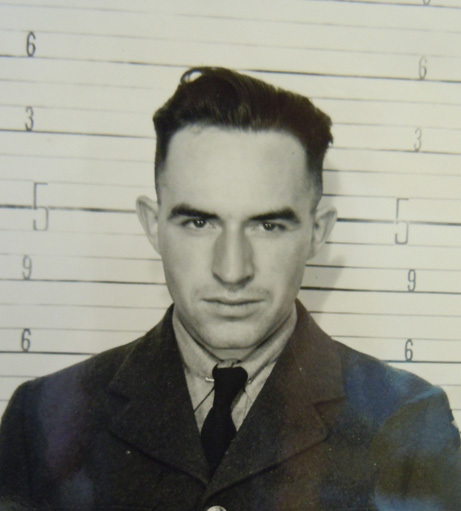 Gowrie flew with Rice and the rest of his crew on the handful of successful operations between the Dams Raid and December 1943, and he was promoted to a Warrant Officer First Class in December. However, their luck ran out on 20 December when they were hit by flak 14,000 feet above Merbes-Le Chateau in Belgium. Although Rice gave the order to bale out, there wasn’t time and the aircraft exploded. Rice seems to have been thrown clear by the explosion, and somehow landed in a wood but the bodies of the remaining six crew members were found in the wreckage. Bruce Gowrie and his five colleagues were buried in Gosselies Communal Cemetery, near Hainaut, Belgium. Another wireless operator with a hobby of building radios! He and Charlie Williams could have swapped catalogs. My name is Gerald Gowrie, nephew to Bruce Gowrie. My dad was Bruce’s brother. His name is Tom Gowrie. My grandmother and grandfather were Malcomn & Phyllis. Time is moving on so fast and I would love to here from anyone who knew of Bruce or my family. I guess we are cousins. My dad mentioned Jessie a number of times. My Dad was 82 when he passed away. His sister Blanche, our aunt was with me in Saskatoon when my Dad passed. I don’t have alot of info on the rest of the siblings except Bruce Gowrie. This info was sent to me by Charles Foster; this contained all of Bruce’s Military Files. Hi cousin Gerald, it is good to hear from you. I have met aunt Blanche and her late husband Paul twice when I was visiting a friend on Vancouver Island. As I grew up in eastern Ontario I unfortunately did not have any contact with the Gowrie side of the family. I do remember as a youngster staying with Grandmother Phyllis when my dad was posted to Germany after the war.